Representa­tive Sam Graves, Republican of Missouri. 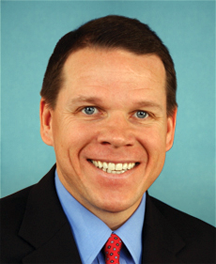 Rep. Graves was the subject of an investigation by the independent, non-partisan Office of Congressional Ethics, with regard to a Small Business Committee hearing that occurred on March 4, 2009. Rep. Graves had arranged for Brooks Hurst, a business associate of his wife's, to testify before the small business committee, of which Graves was at the time the ranking member. Mrs. Graves and Hurst had a joint interest in renewable-fuel facilities in Missouri, and Graves and Hurst also jointly owned several small aircraft and flew together. (Read the complete report of the OCE.) To some, these financial entanglements, together with Graves' rather uncooperative approach to the OCE investigation, raised questions of improper exercise by Graves of his official authority. But there's much more to this story. The OCE was created, in part, to address widespread concerns that over decades, the House Ethics Committee had not been functioning with appropriate aggressiveness. Thus, there was tension between the OCE and the Ethics Committee, which had recently cleared Graves of any wrongdoing. Open acknowledgment by the OCE and the committee of this larger agenda — the conflict between the two bodies — had probably been insufficient in this case. This political struggle, it seems to me, could have affected the proceedings of both bodies, and could have presented at least the appearance of impropriety in itself, because it could have created a conflict of interest for both bodies as they weighed the Graves case. Photo courtesy U.S. House of Representatives. Most of us recognize that ethical standards are more stringent than legal ones. Sometimes, though, even the ethical standard isn't tight enough — we must also avoid the appearance of impropriety. Although some find it frustrating, it's essential in complex societies. You're selecting a vendor. Familiar, Inc., has often worked with your firm, but they're expensive. New Guys, Inc., a recent entry in the market, has low prices, fresh ideas and great references. Since executives from Familiar founded New Guys, you're sure they know their stuff. For many, New Guys would be a tempting option — daring, but probably worth the risk. A reasonable choice. Let's consider a slightly different situation. Suppose that the New Guys sales rep is your boss's sister. What's your choice now? Without the sister factor, choosing New Guys is probably a good business decision. But if you're concerned about the appearance of impropriety, and possible accusations of nepotism, the sister factor makes New Guys an impossible choice, no matter how good they are. Concerns about appearances can require us to forgo what otherwise would be excellent business decisions. Sometimes we must make choices that yield results inferior to other options because they could create appearances of impropriety, even when nothing improper is involved. This can be frustrating, and some are tempted to ignore appearances, especially when accounting for appearances is expensive. Why must we be concerned with appearances? We live in societies in which we transact business with people we don't know well. Our relationships often lack the intimate familiarity of a village or small town. In effect, we've traded away that familiarity for the benefits of the complexity of our large societies. In place of familiarity, we need something else to ensure that the people we interact with are behaving ethically. The standard of appearance provides this. When we meet the standard of avoiding even the appearance of impropriety, others can be more certain that we're behaving ethically. But appearance is hard to define. Although some have put forward concise definitions of the appearance of impropriety, none is universally accepted. Reasonable people can disagree about whether a particular action appears improper. none is universally acceptedappearance, we must be willing to see things from the vantage points of others, including those who lack full knowledge of our decision processes. We must abandon our personal judgment of the appearance, and accept, however temporarily, the perspectives of others, including those with whom we disagree. See "It Might Be Legal, but It's Unethical," Point Lookout for August 14, 2002 for a bit more on the appearance of impropriety. Would you like to see your comments posted here? rbrenQGNVXwVzpvGUcJtmner@ChaczPKogzMdMDuUbkctoCanyon.comSend me your comments by email, or by Web form. I offer email and telephone coaching at both corporate and individual rates. Contact Rick for details at rbrenbzRYgDZAxPXLoLexner@ChacivAnZlyfOhEoZFKIoCanyon.com or (650) 787-6475, or toll-free in the continental US at (866) 378-5470.